Update additional images and details from coolhunting. 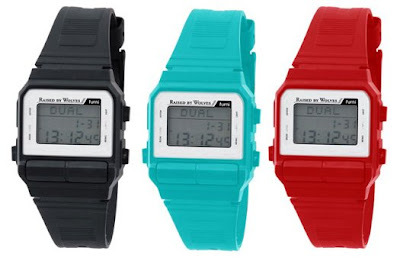 "This trio of retro digital watches comes courtesy of a collaboration between Raised by Wolves and Furni (who worked with CH on the ever-popular Farmer Watch last year). This time around, our friends from the north opted for three color options to reflect a 3D theme (Black, Red and Cyan) and a 1980s-style LCD screen. Water-resistant and bound with a sturdy PVC strap, the watch has an Indiglo-style lighting system and bears an engraving perfectly suited for the Canadian winter. Other features include a phone book, stop watch, countdown timer and multiple alarms with variable melodies." Available at Furni's online shop.
" * 1980’s style LCD unisex wrist watch. * Phone book, stopwatch, countdown timer and multiple alarm features w/melody setting. * Available in Black, Red and Cyan. 3d book and “combo” set. The first 50 buyers of “our combo” set (SOLD OUT) got a free 70 page, individually numbered, limited edition, 7” x 7” softcovered 3d book w/3d glasses entitled “You, Me and 3d – workspaces in different places”. The book featured images done by some of our favorite artists,editors, designers and just flat out cool people. The 3d images were of their workspaces, so you could see just exactly where those dude’s/dudettes pump out their awesome work. It Featured images by Geoff McFetridge, Michael Leon, and Emil Kozak to name a few. (Full Listing Here) A Digital slideshow of the image in the book is available here."